Are you looking for something pumpkiny and delicious to bake? 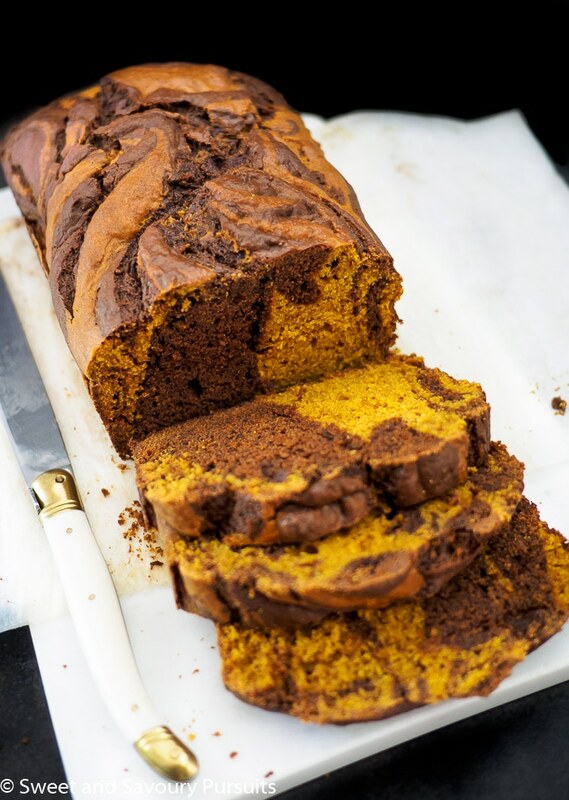 This Chocolate Swirled Brown Sugar Pumpkin Loaf will do just the trick! I’m going to get straight to the point and tell you all about this good-looking Chocolate Swirled Brown Sugar Pumpkin Loaf. When I saw the recipe for this loaf in a recent edition of Canadian Living, I knew I was going to have to make it. Even though I’m sure the original recipe for this loaf would have been delicious, I decided I wanted something simpler and wanted to make sure that the flavour of pumpkin still came through and wasn’t covered up with the strong flavour of the candied ginger and too much chocolate (though I know some would argue you can never have too much chocolate). So I slightly adapted their recipe by replacing the butter with oil (this was more because I wanted to be able to make this loaf all by hand rather than with a mixer) and omitting the candied ginger and chocolate chips. The loaf came out moist, tender and flavourful. 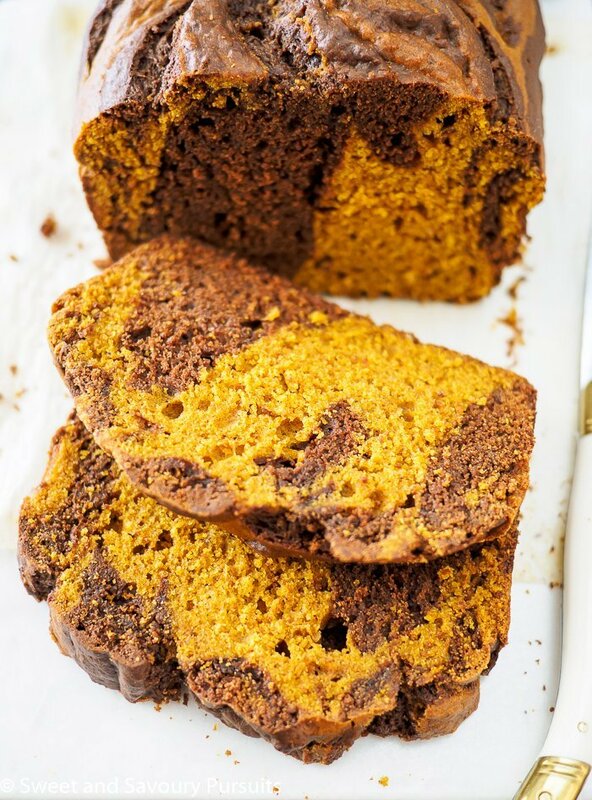 It’s perfectly sweetened and the spices are nicely balanced and not overwhelming, which lets the flavour of pumpkin and the chocolate come through. The loaf is simple to make and doesn’t take much preparation work. It’s perfect when you need a simple dessert, it makes a nice afternoon snack and if you are willing to part with it, this loaf would make a nice little gift. Next time I make this loaf I plan on adding some of my Maple Spiced Walnuts, I think they would make a great addition to this loaf and give it a nice little crunch. Enjoy! 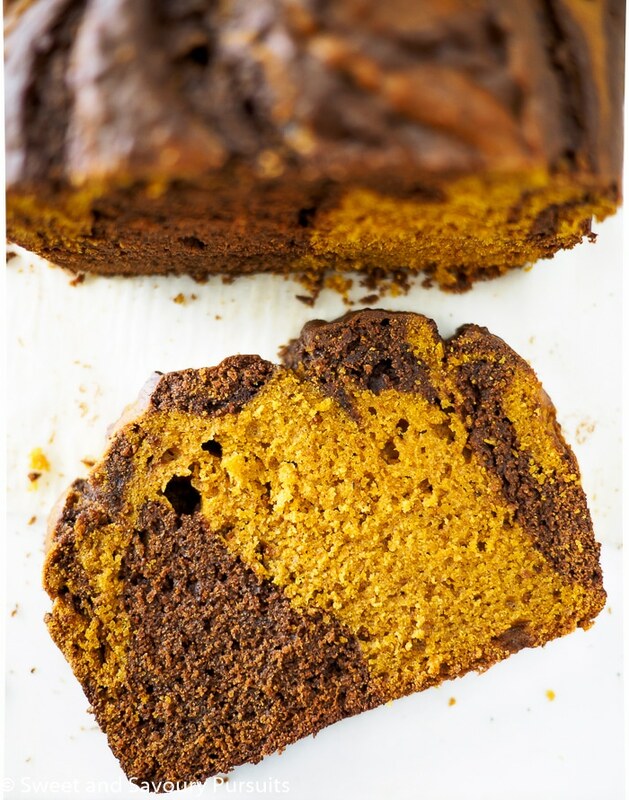 A perfectly sweetened moist, tender and flavourful chocolate and pumpkin loaf. With a rack in the middle of your oven, preheat the oven to 350°F. In a medium bowl, whisk together the flour, baking powder, cinnamon, ginger, baking soda, cloves, nutmeg and salt, Set aside. In a large bowl, whisk oil with brown sugar. Whisk in eggs, 1 at a time. Add the pumpkin purée and vanilla and whisk well. Add the dry ingredients into the pumpkin purée mixture and stir until evenly incorporated. Add the melted chocolate to one bowl of the pumpkin batter. Stir until well incorporated. Alternately drop spoonfuls of the chocolate and pumpkin batters into the loaf pan until you have used all of the batter. To create the marbled effect, use a butter knife to gently swirl the batters. Bake until a toothpick inserted into the loaf comes out clean, about 55 to 65 minutes. Cool in the pan on a rack for 10 minutes and then turn the loaf out unto the wire rack to cool completely. Thanks Sabrina, I know what you mean I can’t get enough of it myself! I cannot get enough pumpkin during this time of year! I love it and all of the those warm and wonderful spices that go along with it! Throw a chocolate swirl in there and I’m in my own little slice of heaven! Beautifully done! I was looking for a pumpkin loaf recipe and here it is. Looks fantastic. Saved and making it very soon. That’s great, I hope you love it! Hi Butool, you can use milk chocolate chips but the chocolate flavour won’t be as intense. Cocoa can be used to replace some of the chocolate but not all because the texture will not be the same. If you have milk chocolate chips but wanted to increase the chocolateness, I would melt the chocolate and add 1 or 2 teaspoons of cocoa to the melted chocolate, if the texture seems off try adding a drop or two of neutral flavoured oil to the chocolate. Let me know how it comes out if you give it a try! Looks so good, can’t wait to give this recipe a try.